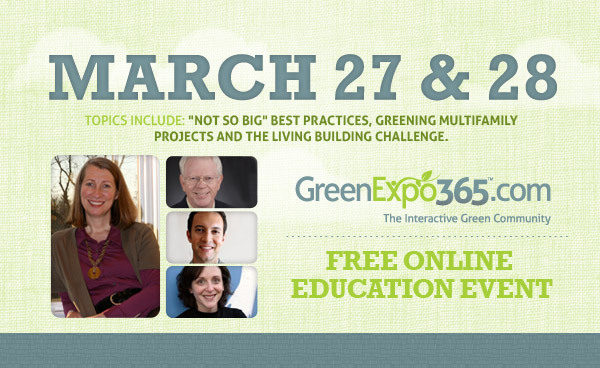 Nationally known architects and builders, including author Sarah Susanka, will headline informative green building webinars during the GreenExpo365 “Live” event March 27 & 28. Architect and author Sarah Susanka will describe the “build better, not bigger” design principles underlying her “2011 Not So Big Showhouse” in an urban infill project near Chicago. The session will highlight practical steps for improving the comfort and functionality of efficient, small spaces using lighting, visual weighting, built-in furniture, and other design details. Sanford Steinberg and Janet Bowler: "Greening Your Multifamily Projects with the National Green Building Standard"
Nationally recognized architect Sanford Steinberg and construction services executive Janet Bowler will share insights on the benefits of building and certifying multifamily housing projects to the National Green Building Standard. This session will provide helpful tips for builders, designers, and developers. Architect Steve Sunderman, a member of the USGBC Center for Green Schools Committee cabinet, will demonstrate how paving material choice for roads, highways and parking lots impacts the triple bottom line of prosperity (saving money), social equity (improving people’s lives), and sustainable environments (environmental stewardship). The Seattle 2030 District is a high-performance building district in downtown Seattle that aims to dramatically reduce environmental impacts of building construction and operations, while increasing Seattle's competitiveness in the business environment and owners’ return on investment. Brian Geller, founder and Executive Director of the Seattle 2030 District, will provide insights on how the organization is working with architects, businesses, contractors, and building owners to implement the Architecture 2030 philosophies and goals. What if every single act of design and construction made the world a better place? Eden Brukman, vice president of the International Living Future Institute will discuss the Living Building Challenge, which is a philosophy, advocacy tool and performance-based certification program that seeks to have human habitats generate all needed energy using clean, renewable resources; capture and treat water through ecologically sound techniques; incorporate nontoxic, appropriate materials; operate efficiently; and maximize beauty. In addition to the live webinars, GreenExpo365 users can access numerous other green building webinars on demand. Many of these are registered with the American Institute of Architects (AIA), and AIA members can use them to receive mandatory continuing education credits.